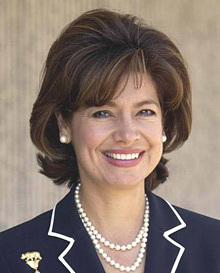 Promerica Chairman Maria Contreras-Sweet began thinking about the lack of Latino banks some years ago when she was California's secretary for business, transportation and housing and responsible for banking regulation. Los Angeles - Financial services for Latinos may mean money wires and store credit to many, but a group of wealthy Latinos says it is time to take banking for their fast-growing community to a more sophisticated level. Together with non-Latino investors they will soon launch Promerica Bank, the first Latino bank in 35 years in California, home to America's largest Hispanic population and a powerful magnet for immigrants from south of the border. The bank's creation coincides with a rise in Latino power, as an increasingly entrepreneurial and educated Latino community aims to prove its worth amid calls for a crackdown on immigration, mostly from Latin America. But Promerica Chairman Maria Contreras-Sweet began thinking about the lack of Latino banks some years ago when she was California's secretary for business, transportation and housing and responsible for banking regulation. "There are about 40 Asian banks operating in California, and it occurred to me, Why don't we have more Latino banks operating in California when you look at the population?," she told Reuters. The last census in 2000 showed one-third of California's 34 million people are of Hispanic origin, compared with 12 percent nationwide. Los Angeles, which has a Latino mayor, has the largest Mexican population in the world after Mexico City. When she left office, Contreras-Sweet convinced fellow leading Latinos, like Henry Cisneros, the former U.S. secretary of housing under Bill Clinton, to get on board for the long bank incorporation process. "Lo and behold, when we submitted the application, we were told we were the first Latino de novo in 35 years," said Contreras-Sweet, who was born in Mexico. The investors, called "organizers," now number 27 and range from Southern California real estate tycoon Ed Roski, who is not Latino, to Cuban-born music entrepreneur Rodri Rodriguez, famous for the Los Angeles mariachi festival. With capitalization of $20 million and two branches in the Los Angeles area, Promerica will open in three months and focus on Latino family businesses with annual revenue of $1 million to $10 million. Working capital and real estate loans will be key products at the outset. While many of the big banks do have some sort of strategy for tapping the Latino market, Promerica's backers say they lack the inside track on how local Latino business works. "Most of the loan approval mechanisms for banks are back East and those that are approving those loans have little to no knowledge on the community structure or the habits of Latino entrepreneurship in Southern California," said Rodriguez. "Many don't know that...the fastest growing segment of small business owners in California is Latino," she added. Successful Latinos complain that the non-Latino business world has underestimated and underserved a consumer group that will spend some $1 trillion nationwide by next year. "It is one of the last massive market inefficiencies in the American economy," said Fernando Espuelas, who emigrated from Uruguay as a boy and is chairman of media company VOY. Espuelas wants to improve access for the young Latino population to financial services. VOY, which means "I go" in Spanish, recently signed a deal with the School Loans Corporation (SLC)to launch a bilingual loan service "by Latinos, for Latinos." "I personally believe this is a very significant market for us," said Maurice Salter, CEO and president of SLC. He cites a forecast that Latinos will account for 18 percent of university enrollment in 2010, up from 8 percent a decade earlier. Inroads in higher education, like those made by Asians in the last decades, will be key for Latinos to take better financial care of their community. "I want this to be authentic," said Contreras-Sweet. "If we are going to have a bank that services the Latino community, we ought to have people that understand it and can service it with more insight into what those nuances are." But she insists that Promerica does not seek to be exclusively for Latinos and should promote integration with other communities rather than put up barriers. "It is not our intent to separate the community, but rather integrate it in society," she said.